Debris is everywhere after after a EF3 tornado struck Hattiesburg on Saturday, Jan. 21. 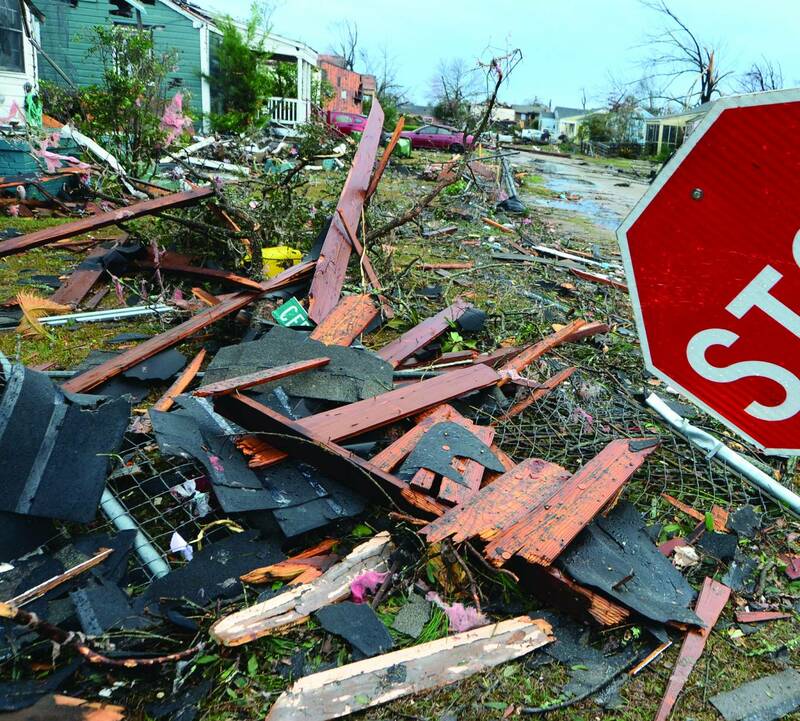 ALEXANDRIA–Despite five confirmed tornadoes, Louisiana was not pummeled as badly as its neighbors over the weekend as a strong storm system swept across the south. In Texas and Oklahoma strong winds and a severe ice storm crippled the area while to the east a rash or tornadoes left a swath of multiple deaths – 18 fatalities with scores injured in Mississippi and Georgia – and destruction costing millions in its wake. The enormous storm system which blew through Louisiana Jan. 21, left trees uprooted, destroyed homes and trailers, toppled power lines, snapped trees in two, and injured several people. Gibbie McMillan, Disaster Relief director for the Louisiana Baptist Convention, said no teams were being dispatched to these areas in the state as local communities had already begun the clean-up process. However, five teams – three to Petal, Miss., and two more to Woodward, Okla., — were being dispatched. Caught in that same storm was William Carey University’s Hattiesburg’s campus. William Carey is affiliated with the Mississippi Baptist Convention and has campuses in Hattiesburg and Biloxi. The campus, which has approximately 4,400 students, 800 of whom live on the Hattiesburg campus, was slammed by an EF3 tornado. According to the school’s website nearly all of the school’s 30 buildings were damaged and seven students were injured. School officials are assessing whether several of those buildings may have to be demolished, according to the college’s website. “We are overwhelmed by the outpouring of support we have received from friends and supporters, near and far. Our needs are great, but we are heartened by having so many to stand by us with their prayers, their gifts, and their help,” Garry Breland, WCU’s vice president of academic affairs was quoted on the school’s website. The three Louisiana teams include a four-man crew from Eastern Louisiana Baptist Association; a six-man unit from Northshore Baptist Association, and an eight-man group from the Carey association. The two ice storm response teams – one from Eastern Louisiana and the other from the Washington Association – heading to Oklahoma will face some different challenges caused by the ice storm and winds according to McMillan. The National Weather Service said two of the five twisters were strong category F-2 tornadoes. One had winds that reached 125 mph just outside the town of Natchez and Point Place, near Natchitoches. The other F-2 cut a 990-yard wide path for more than 8 miles just outside Plain Dealing in Bossier Parish before finally dissipating. Elsewhere in the state, F-1 tornadoes set down near Colfax and Georgetown in Grant Parish, and Jena in LaSalle Parish. In all 50 homes were damaged, while only just a dozen people were injured in the outbreak. “It was “a miracle” no one was injured worse, given the tornado bowled over two mobile homes, both with people inside at the time. Those people had “barely a scratch,” Bossier Parish’s Paris Julian Whittington said in a video posted to Facebook. Though spared from the hard-hitting storms, the New Orleans area was kept under a tornado watch from Jan. 20 to Jan. 21, as a line of thunderstorms rolled through the state and into Mississippi. Portions of West Feliciana and Pointe Coupee parishes were put under a tornado warning briefly Jan. 20.